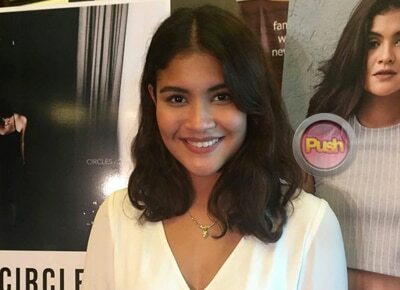 Kiana Valenciano talks about the real score between her and Sam Concepcion. Having grown up as the youngest out of the three children of Gary Valenciano and Angeli Pangilinan, Kiana Valenciano has been surrounded by the showbiz industry all throughout her life. But Gary V.’s “unica hija” seems to want to tread a different path for herself. "(When it comes to joining showbiz) we’ll see. Siguro (I’ll be visible) when it comes to brands or like maybe a cause that I really believe in. With Fuji kasi I really love the brand. I love all of their cameras so it really was a no-brainer to be part of this. I like taking photos of anything actually. So if you like at my phone yung memory niya full na kasi lahat talaga pini-picture-an ko. Dogs, when I travel the nice things I see on the street, yung mga ganun,” she shared during the Fujifilm Photofest event held last month in Quezon city. After recently launching her first online single on Spotify, Kiana (born Kristiana María Mikaela) said she is not ready to let go of her semi-private life. "Yes I’m still thinking about it. I kind of like my semi-invisibility right now (laughs). And I’m enjoying the Internet lifestyle. So being known online is something that I prefer. I have a blog and in my blog I post music videos and fashion stories and travel videos,” she said. Even as a blogger who is active on social media, Kiana said she is still very careful with her posts online. "I think when it comes to personal posts pinag-iisipan ko talaga. Kasi I don’t know how much of my personal life I want on social media. I’m more open on Twitter kasi dun parang opinions ko yun, yung thoughts ko. When it comes to Instagram, yung mga pino-post ko it’s more of siguro friends and family and art. Pero yung personal hindi masyado. I think I’m very OC with my feed but not to the point na hindi ako mag-po-post ng photo. Kasi yung iba kasi gusto nila all blue or all white. Ayoko maging superficial yung feed ko na parang puro clothes lang. Although I’m not very personal about it, I still want people to see who I am. Na-relatable akong tao. I like to go to the gym. I like to have fun with my friends,” she explained. Kiana said her friends in the industry have been supportive of her singing and being part of events just like when she walked the Fujifilm Photofest runway. "A lot of my friends are in showbiz so obviously they are very supportive. But I think it should be more of if you want to do it you should do it. If you don’t want to do it that’s fine,” she shared. With rumors that she is currently dating singer Sam Concepcion, Kiana initially opted to downplay their closeness. "I’ve known Sam since I was nine years old so we’re around each other all the time. I don’t know. There is nothing to share,” she said. But when pressed further for the real status of their relationship, Kiana did not confirm nor deny that there is something between them. "I don’t know. Whether it’s there or whether let’s just all keep it behind closed doors,” she added.